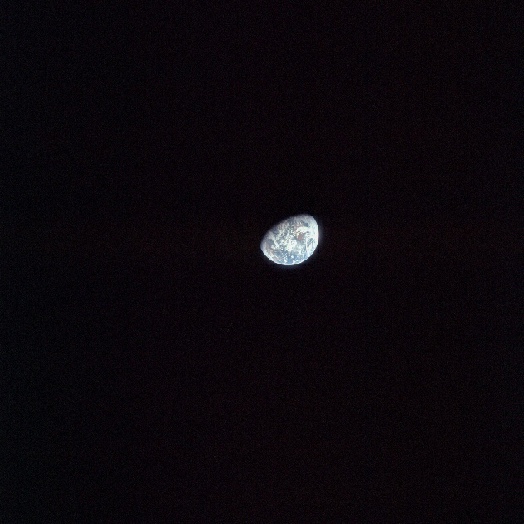 Apollo 8 is of significance because the astronauts on board became the first people to see the far side of the moon, and the first to witness an Earthrise: the apparent rising of the Earth from below the Moon's horizon as the orbiting spacecraft reached Mare Smythii in its passage around the Moon. This phenomenon had, of course, already been witnessed by Soviet and US unmanned probes, but to be captured by human eyes added more significance to the event. 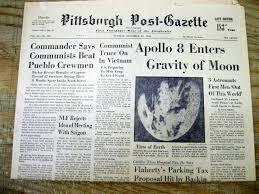 The mission was launched on 21/12/68, reached lunar orbit on 24/12/68, and re-entered the Earth's atmosphere on 27/12/68. During that mission, 865 images were taken on 7 film magazines. 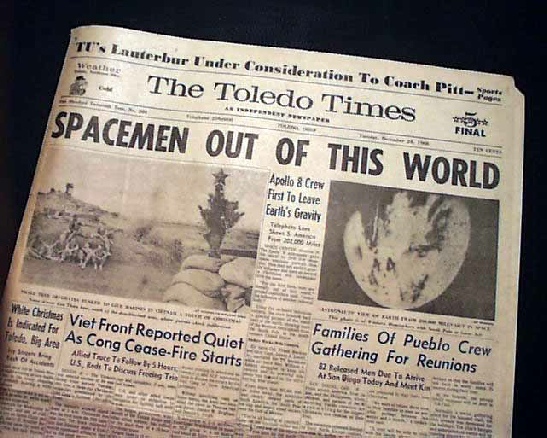 The majority of the images were used as source material for preparing future landing sites, but images of Earth are found on magazines 12-16. A number of TV broadcasts were also made, and images will also be examined from those broadcasts. Each image will be given in its original form, then compared with satellite images from the same day. The importance of the original image is mostly to demonstrate how small the Earth is in those images, despite their ability to reveal tremendous amounts of detail. ESSA 7 images are available in this document: ESSA 7 data catalogue. I actually own a hard copy of this and confirm that the online scan is absolutely accurate. 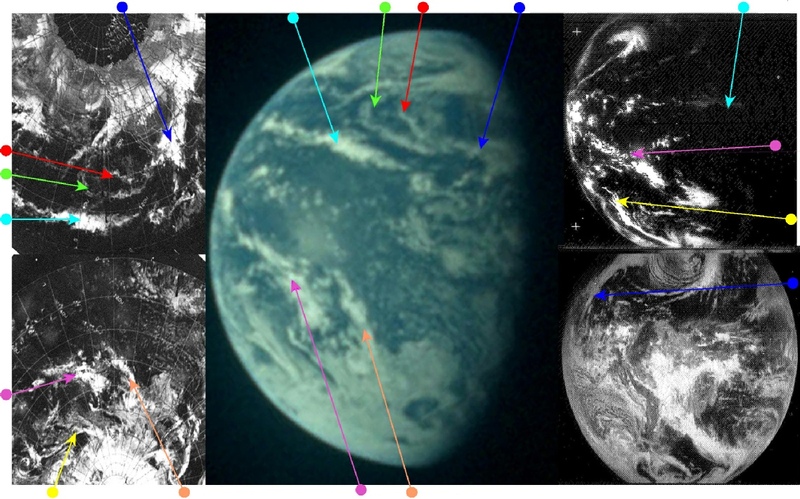 ATS-3 and ATS-1 images for at least some of the mission can be found in here ATS-III data catalogue. This document has ESSA-7 images covering the north Atlantic throughout the mission and these are added where possible. The full transcript of the mission can be found here: NASA link. The mission timeline is here: NASA link. The final section will look at the meteorological data available, to see how the photographic record compares with ground based measurements of the weather at the time. 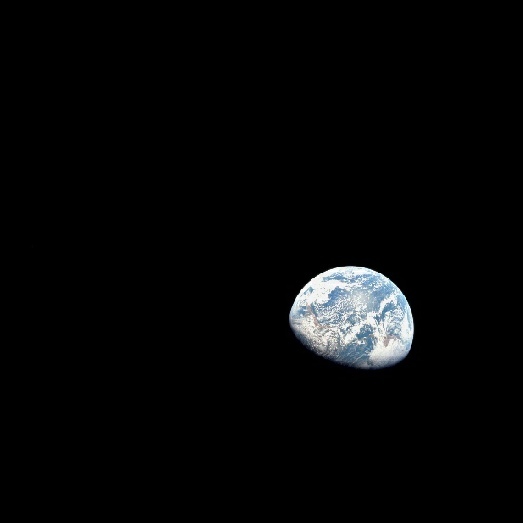 While it doesn’t show the full Earth, the first images of interest to us are actually from the 16mm footage taken at the same time as the SIV-B separation (16:11 GMT). We know this as some of the SIV-B panels can be seen tumbling towards the Earth. 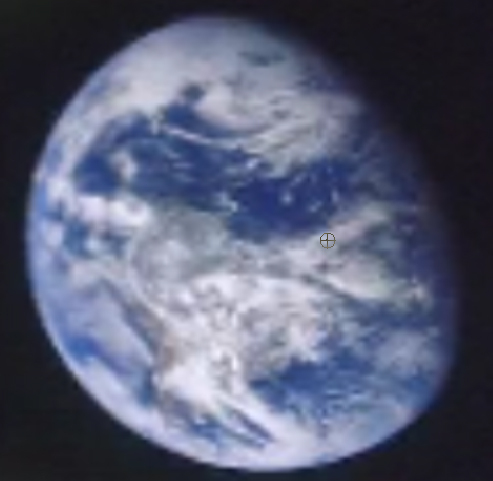 By taking several screenshots from the video (available here) a substantial portion of the Earth’s disk can be assembled into a single image. This is shown in figure 4.1.1. Figure 4.1.3: ESSA-7 satellite images compared with AS08-16-2593 and Stellarium estimate of time at terminator. 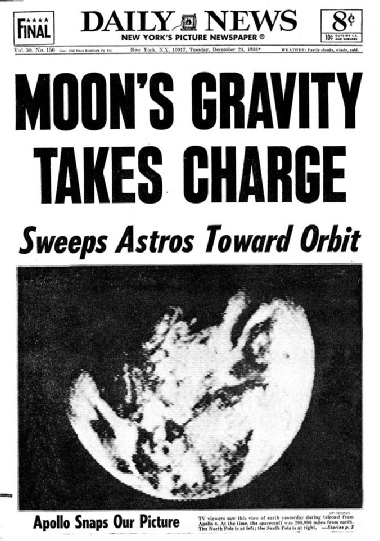 It is also taken very soon after separation from the Saturn IV-B rocket, as there are photographs of this event before it in the magazine. According to the timeline this occurred at 16:12 on 21/12/68. The most obvious features include the large spiral cloud system in the North Atlantic (yellow arrow), the '<' shaped cloud feature off Brazil (green and magenta arrows), and lines of clouds trending south-east from Argentina (blue and cyan arrows). It is also worth noting the shadow under the linear cloud mass near the terminator over north Africa (picked out by the green arrow). The direction of that shadow under the clouds is consistent with the sun's direction at sunset. It’s also obvious that the now moon bound craft has moved further East over the Earth’s surface, as we can now see the West coast of Africa. We also have a 16mm still taken at around the same time, if we examine the amount of Africa visible it would appear to have been taken about 15 minutes after the still image (figure 4.1.4). Figure 4.1.6: ESSA-7 satellite image compared with AS08-16-2595 and Stellarium estimate of time at terminator. In this image, the long shadows are cast by the clouds over the Amazon, and the yellow & purple arrows point to the same weather systems as they do in the previous figure, although only the thin tail curling away from the yellow arrow system is still visible. Much more prominent now are a large spiral system off the north American coast and below Alaska (green arrow), and the scattered clouds over the south Pacific. There is also a prominent plume of cloud heading northwards from Antarctica (magenta arrow), and a small whirl of cloud off south America (red arrow) that are all easily found on the satellite image, along with all the other weather patterns. 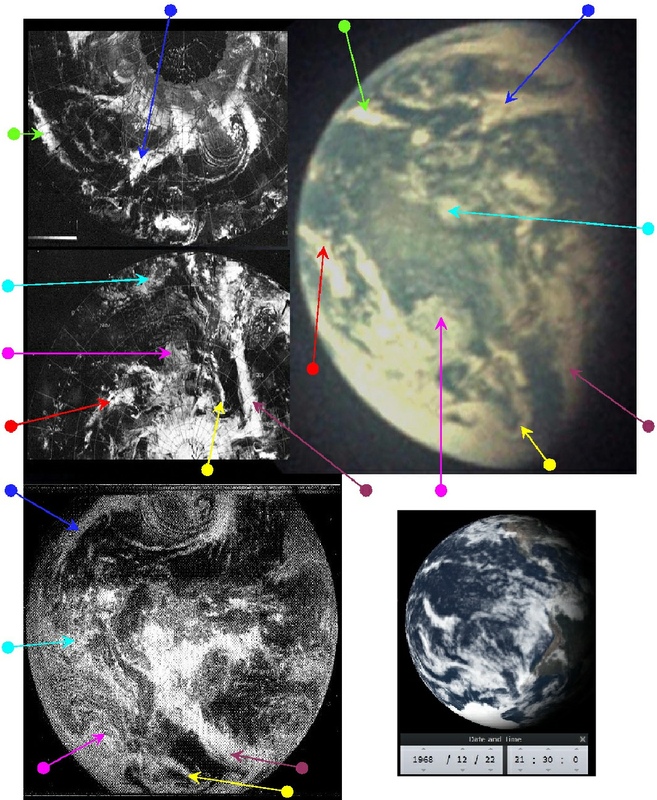 The Earth has rotated by a consistent amount between the first two photographs analysed, the shadows lengthen at the terminator, and the weather systems are still visible from the previous image. The bright spot showing the sun's reflection can be seen in this image, and the perspective of the photographer has changed noticeably, with much more of the Antarctic region in view. Stellarium suggests a terminator time of around 20:45 on the 21st. The ESSA track over the terminator region was commenced at 17:00, as this was when track 2 (pass number 1593) began, as discussed for AS08-16-2593. 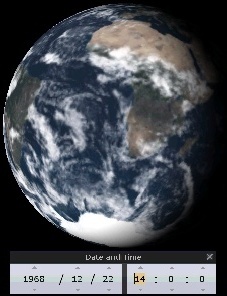 AS08-16-2596 shows a very similar view but the Earth has rotated slightly, and there isn’t enough difference to make it worth a separate treatment. 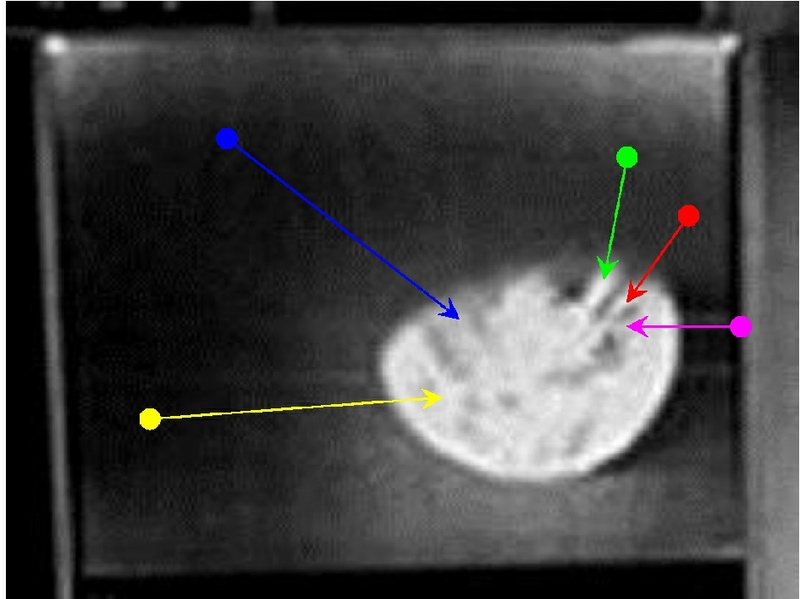 As with the previous image we also have a 16mm still equivalent, shown in figure 4.1.7. Although there is no land visible in the image, it is possible to mark the position of the terminator with Stellarium by using the previous image analysis as a reference. The weather system highlighted by the green arrow is the same in figure 4.1.9 as in figure 4.1.6, which means that the terminator is just about on the west coast of the USA, which puts the time at around midnight on the 22nd. This corresponds well with the ATS-1 image, which was recorded at 00:54 on the 22nd, and it is evident from it that the eastern half of the image is in, or close to, darkness. 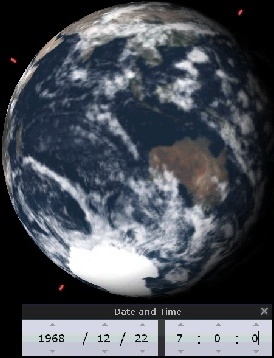 Stellarium also indicates that Australia should be visible on the western limb. 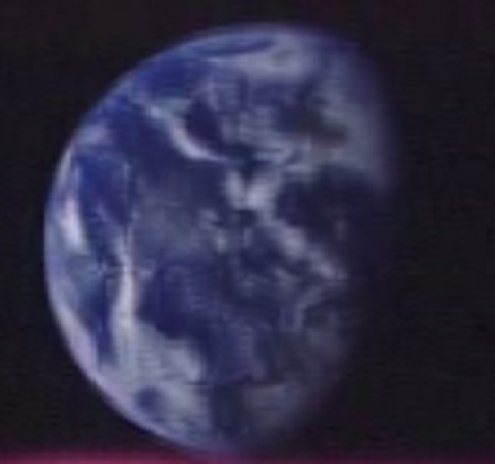 This part of the Apollo image is a little washed out, but the magenta arrow points to a band of cloud that should lie off Australia's east coast and that is visible in all 3 images presented here. 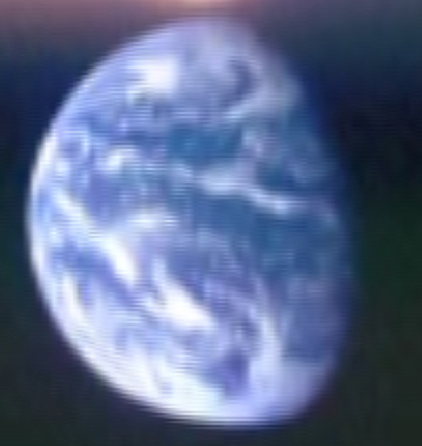 The presence of that green-arrowed system is another clue, if one were needed, that this is a picture that is part of a continuous sequence recording the Earth as it rotates, and not some sort of made-up on the spot fiction. 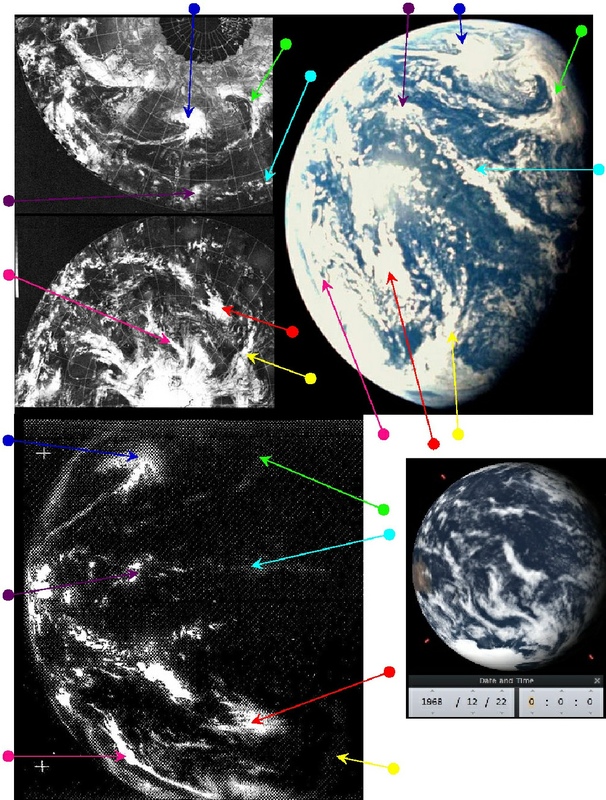 As with the other images, and as will become apparent for every other image presented throughout the entirety of this report, the cloud systems on the satellite images match those of the Apollo image. The ESSA path that most represents the terminator line is track number 5, which corresponds to orbit number 1596, which commenced at 22:05 on the 21st. 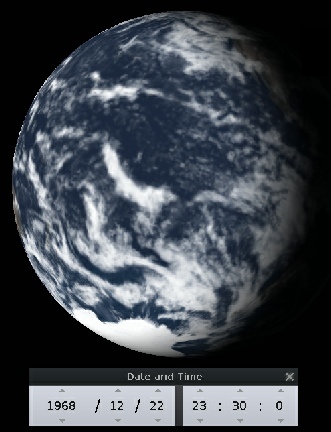 012:06:27 Anders: This PTC attitude really isn't the greatest for taking pictures of the Earth. PTC stands for 'Passive Thermal Control', or the 'barbecue roll' slow rotation that allowed the CSM to balance its temperature in direct sunlight. As before, we have a pair of 16mms still for comparison (figure 4.1.10). While there is no apparent time difference between the first still on the left and the Hasselblad, there is a clear amount of rotation evident in the next still. Figure 4.1.12a: ESSA-7 image compared with AS08-16-2599 and Stellarium estimate of time at terminator. Figure 4.1.17: ESSA-7 (left and above) and ATS-3 (below) images compared with AS08-16-2602 and Stellarium estimate of time at terminator. The green and purple arrows in figure 4.1.15 point to the same systems shown in figure 4.1.17, and the thin swirls of cloud discussed previously are now clearly in view (red arrow). Similar thin wispy bands of cloud can be seen off the coast of south America (south of the cyan arrow). 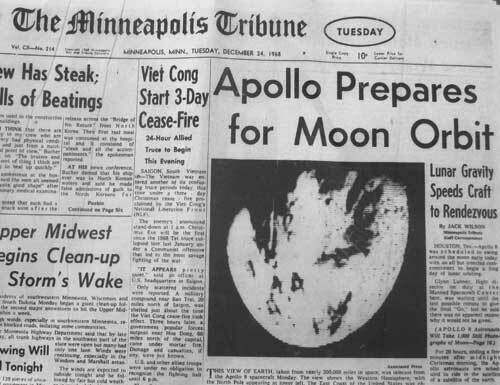 For the first time in this section, an ATS-3 image is usable, and this is also showing an excellent match to the Apollo picture. That image was taken at 14:58, and it is evident that the terminator is much further east in that image compared with Apollo's. ESSA's orbit best matching the terminator is number 1606 (track 2) which commenced at 18:05, just 55 minutes before the Apollo photograph, which Stellarium puts at 19:00. Ostensibly, the ATS & Apollo images seem (terminator line apart) identical, but there are subtle differences. 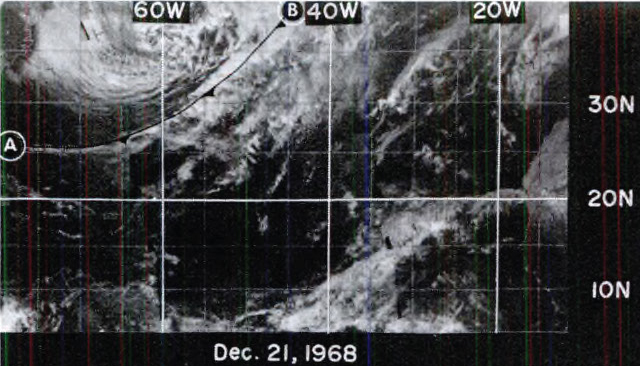 The clouds over the always dynamic Amazon climate system, for example, are in a different formation to Apollo's, where they are much more similar to the ESSA image taken nearer the time. There are also differences in the way the twin streams of cloud picked out in red are shaped. In ATS-3, they are much more definitely joined to the main bank of cloud (green arrow) and diverge more as they move westward. In the ESSA image, as with Apollo, the northernmost stream has broken away from the main bank of cloud, but there is a wider gap between the streams and they appear more parallel. This is a common theme throughout this research: ostensibly identical systems in fact showing small variations that are entirely consistent with the time differences between the images concerned. A short while after AS08-16-2602, we have AS08-16-2604. This photograph shows a very similar scene to that of 2602, but much of northern south America has passed beyond the terminator, and more of the Pacific is in view. AS08-16-2604 is shown in figure 4.1.18, and analysed in figure 4.1.19. Figure 4.1.19: ESSA-7 (left) and ATS-3 (below left) images compared with AS08-16-2604 and Stellarium estimate of time at terminator. As suggested previously, little has changed in the weather systems already shown, but it does serve to show (again) that the Earth is rotating as the CSM gets further away, and that that rotation brings into view weather systems that were previously hidden. There is no change in the ATS-3 timing, but ESSA's most representative track for the terminator region is number three (orbit 1607), one orbit later than the preceding image, and therefore starting at 20:00. Stellarium suggests a time for the image of 21:30, just 90 minutes after the previous one, and all of the colours for arrows to identify weather systems in figure 4.1.17 apart from the green and red ones are used again. The reader is also referred back to figure 4.1.6, which showed the same view roughly 24 hours earlier, and where magenta is used to identify the same weather pattern. Those two day's weather patterns are compared below in figure 4.1.20. The two days’ images show what is obviously the same weather system, but that has developed over 24 hours to extend further northwards, while a frontal band to the west moves further eastwards towards Chile. Next up in the sequence of images is AS08-16-2605, and as will be seen shortly shows a relatively small amount of rotation since the preceding photograph on the magazine. Figure 4.1.21 shows the original Apollo image, and 4.1.22 the analysis. The degree of movement is enough to mean that there is a small amount of surface covered by both ATS-1 and ATS-3. The Earth has rotated sufficiently to lose the ATS-3 satellite, and the ATS-1 dated the 23rd is now nearer in time than the 22nd. ESSA's image date is still the 22nd. The ATS image was actually taken at 22:43 on the 23rd, over 20 hours after the Stellarium estimate of the image time, and understandably there is a much bigger difference between the Apollo image and ATS-1. 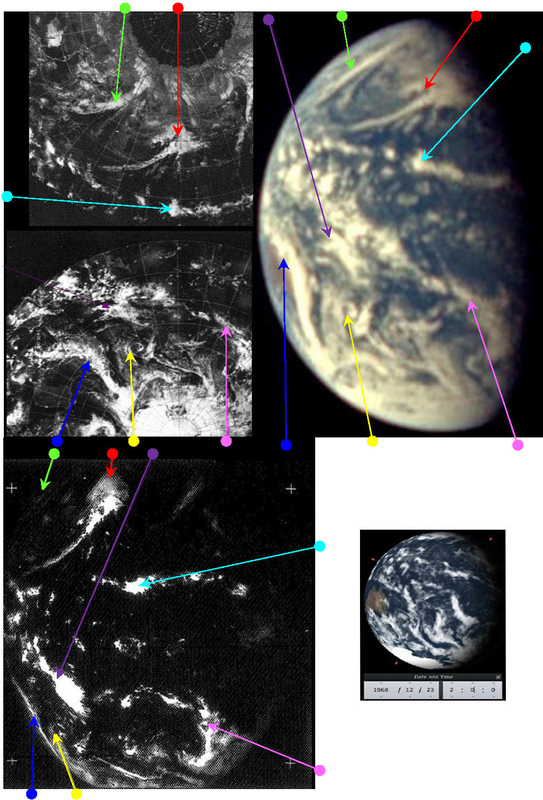 However there are, as can be seen from the arrows used, still identifiable weather systems that can be seen on both those images. Of those systems, the most striking ones are at the northern and southern ends of the planet. In the north there are the two frontal bands (green and red arrows) marking the boundaries of lighter swirls of cloud between them. To the south there are the storms heading north from the Antarctic, including the striking tight curl of cloud marked by the yellow arrow, and the long band of cloud making its way to Australia's east coast. 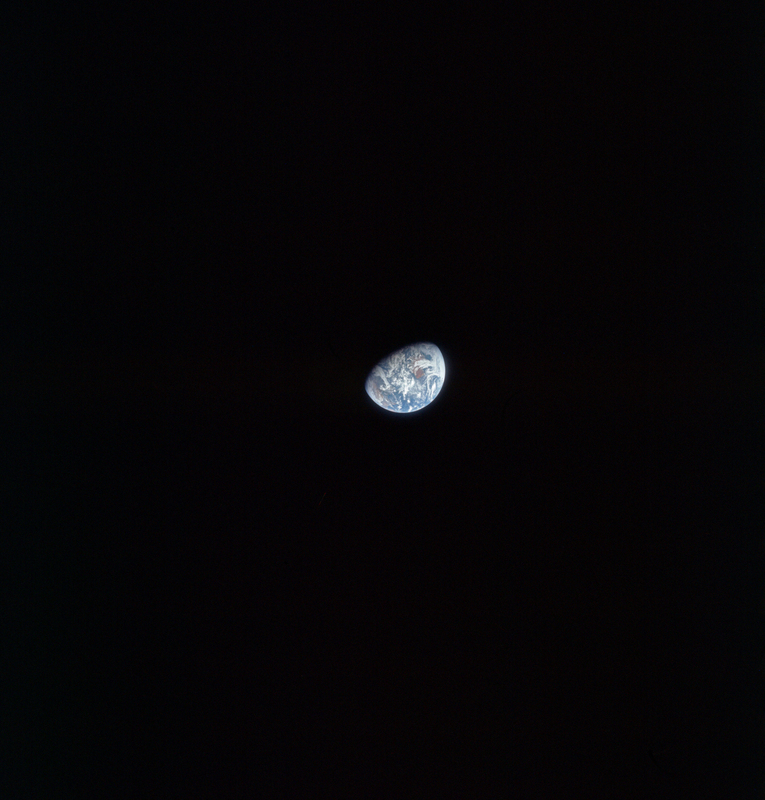 ESSA is a much better match for the Apollo image, and this is explained by the images being taken much closer in time to it. Orbit number 1609 (track 5) is the closest to the terminator, and commenced at 23:00 on the 22nd. 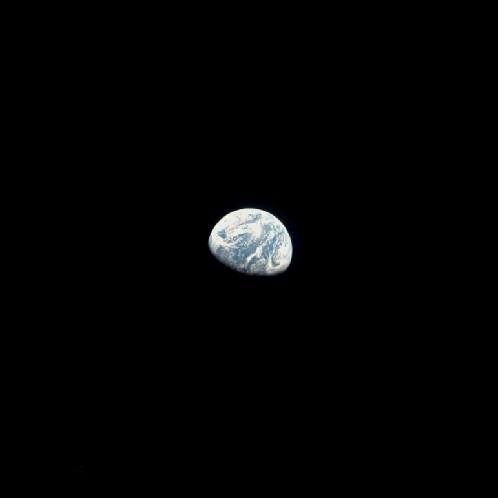 The next image of Earth we have is extremely significant because it comes not from images presented after the fact but from a live TV broadcast. 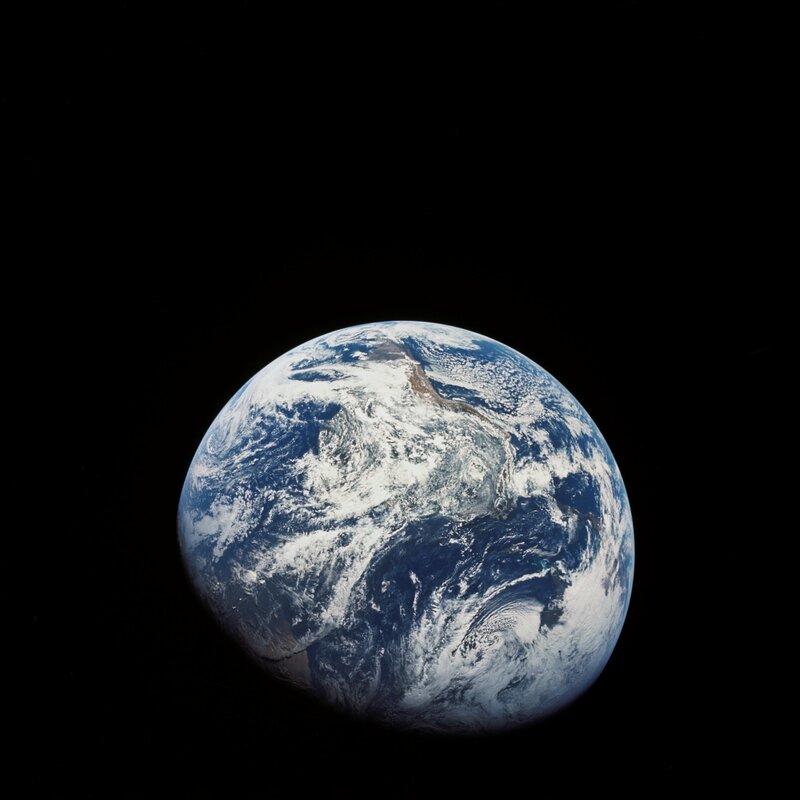 As part of their journey, the Apollo 8 crew made a number of short live TV broadcasts to Earth. 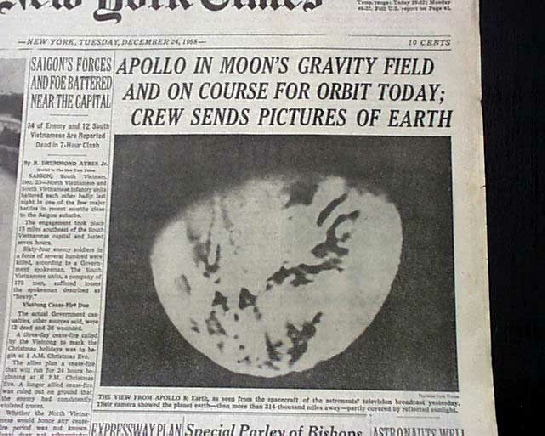 The first broadcast on the 22nd did show Earth but was overexposed, though photographs from it did appear in the following day’s newspapers. 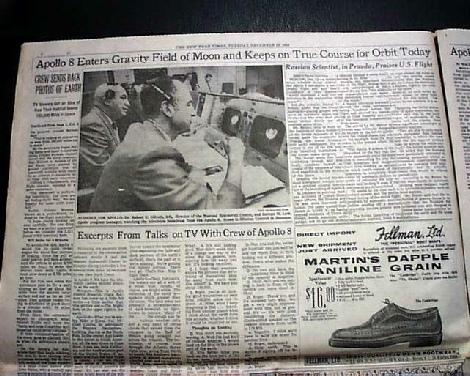 The most famous of the broadcasts is the Christmas Day broadcast made while rounding the moon, in which the crew took turns to read out a number of verses from Genesis. Clips from these broadcasts are viewable at the Honeysuckle Creek website. Two clips from the Honeysuckle Creek website are of interest, as they show images of Earth. 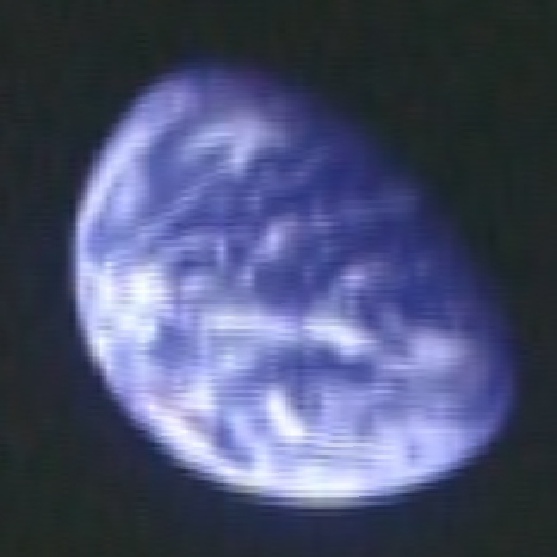 The 2nd TV transmission shown was carried out at 19:53 on December 23rd, and it is possible to capture a screenshot of the Earth from that and compare it with the ESSA 7 and ATS-3 data. 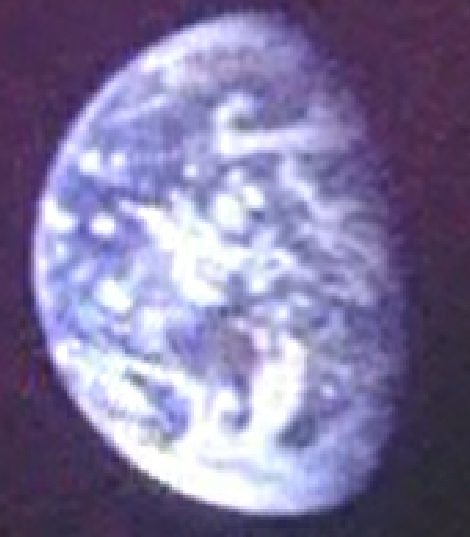 The ATS-3 image was taken at 18:16 GMT – just over 90 minutes before the TV broadcast. Honeysuckle Creek have done their own image showing the orientation of the Earth at that time (figure 4.1.25). Figure 4.1.32: ESSA-7 (left and above) and ATS-3 (right) compared with AS08-16-2608 and Stellarium estimate of time at terminator. 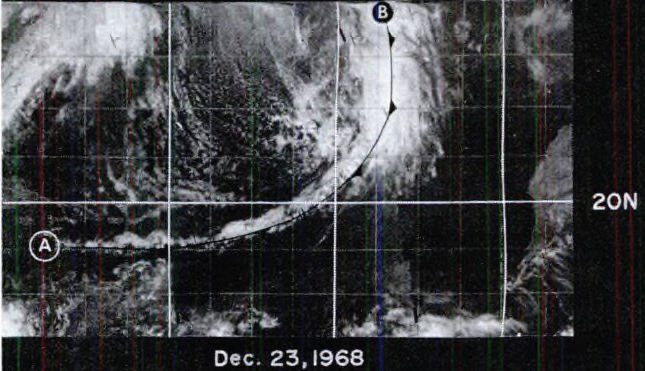 While Christmas day 1968 is the very latest that the picture could have been taken, the satellite record places the photograph very definitely on the 23rd, with Stellarium placing the time at 21:00 on that date. 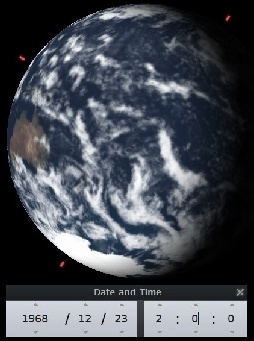 ATS-3's image was taken at 18:16 on the 23rd, while the area around the terminator line was imaged by ESSA on orbit 1618 (track 2), which commenced at 17:05. It’s also very obviously the same view that can be seen on the TV broadcast images, the only difference being that a substantial chunk of South America has slipped into darkness. 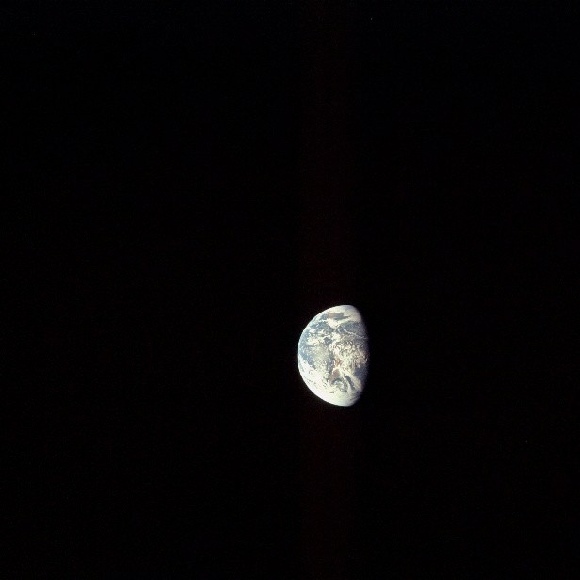 Looking at the Apollo photograph, they are describing accurately what they can see, and have not (as in all cases when discussing the view of Earth on any mission) been prompted in any way. The long cloud heading north-east from the Gulf is indicated by the blue arrow, and the thin cirrus clouds described from the Gulf into the Atlantic are likely to be the ones pointed out by the red arrow (although they actually extend from north to south only if coming from the Atlantic). The maroon arrow points to the same weather system off the coast of Chile identified in previous images, and the purple and yellow ones over south America itself also point to weather systems identified on the previous day by the same colours in figure 4.1.17. 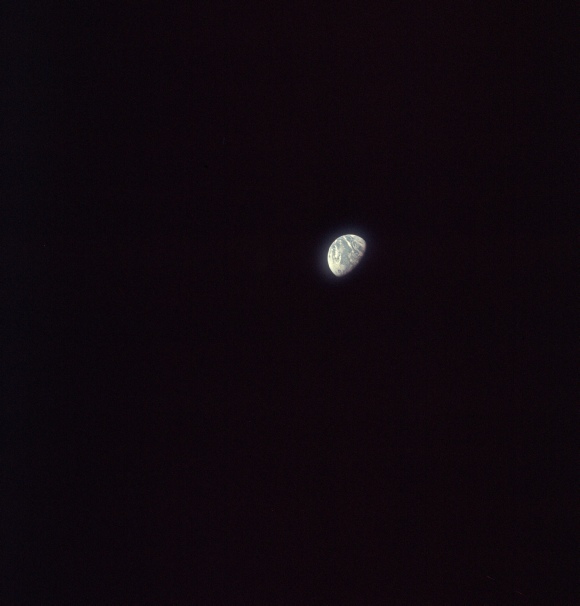 The next images from Apollo 8 are from lunar orbit. Click the buttons below to navigate there or elsewhere. Figure 4.1.15: ESSA-7 images compared with AS08-16-2601 and Stellarium estimate of time at terminator. 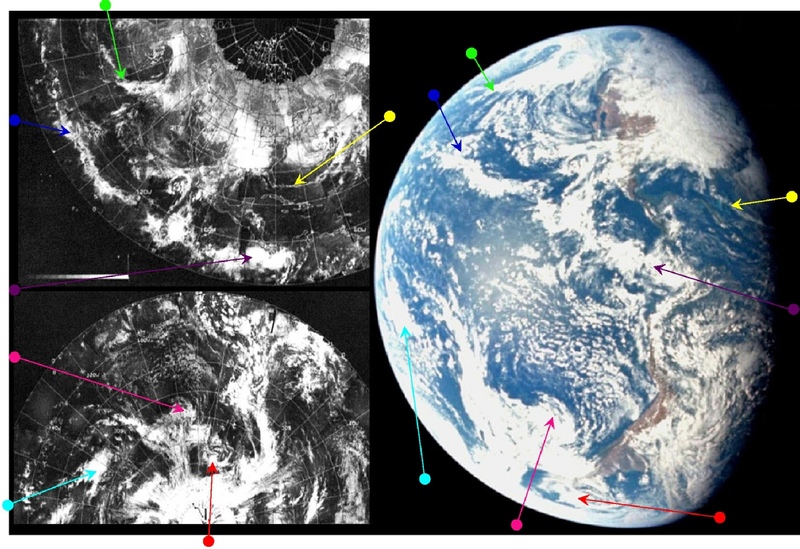 As usual, the weather patterns on the satellite images correspond exactly with those on the Apollo image, and several of the cloud systems visible in this image will be seen in later ones, not least the spectacular 'dog-leg' frontal mass connecting the Antarctic to south America (purple arrow), and the large frontal mass preceding a series of thin lines of cloud in the north Atlantic (green arrow, although only the main cloud front is visible in this image). Although the Apollo image is slightly out of focus, it is still possible to pick out the thin clouds over north Africa (eg the cyan arrow), the coastal cloud banks around southern Africa, the typical frontal system off South Africa itself (yellow arrow). Stellarium suggests a time of around 14:00 on the 22nd for this image. ESSA's nearest track to the terminator is track 11. This is orbit number 1602, which is labelled as the first orbital pass on the image dated the 22nd, and was commenced at 10:05 on the 22nd. 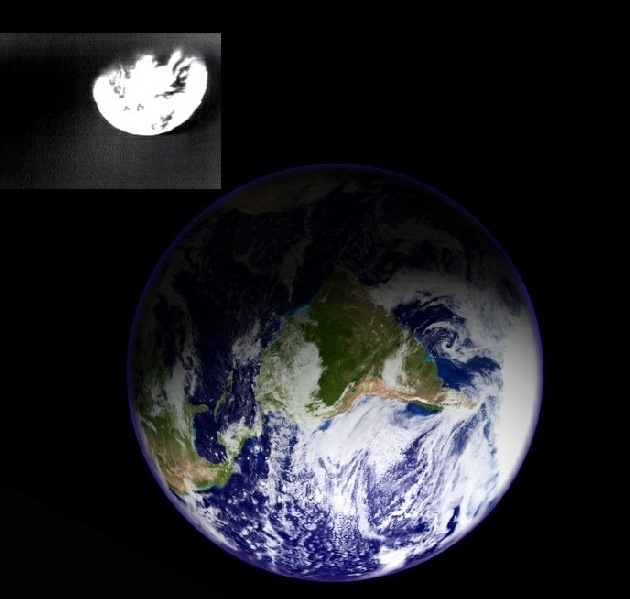 The ESSA satellite would barely cover the area around the terminator before the Apollo image was taken, never mind the rest of the photograph. It’s worth mentioning here that there are Corona passes available for this image, but as none of the areas actually feature any cloud there isn’t much point in introducing them to the discussion. The next image in the magazine, AS08-16-2602, shows that another few hours have elapsed, and south America dominates the scene. This photograph is shown below in figure 4.1.16, and analysed in figure 4.1.17. 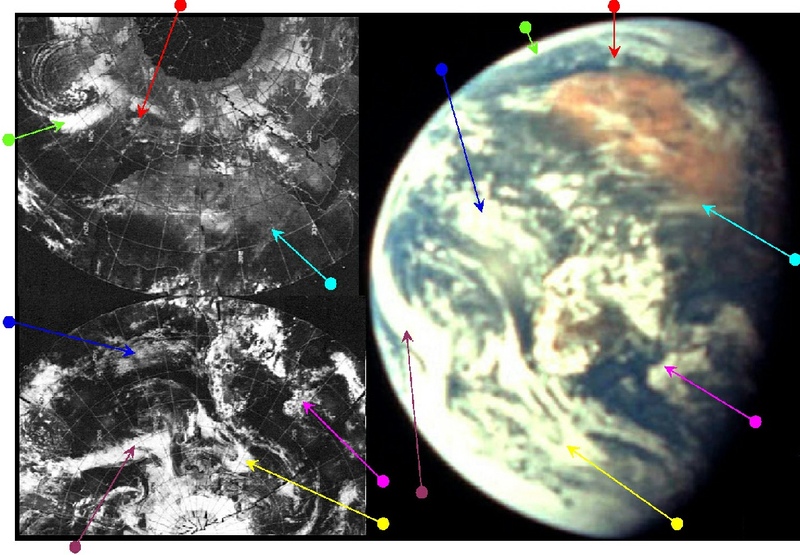 Figure 4.1.22: AS08-16-2605 compared with ESSA (top & bottom left) ATS-1 (top right) and ATS-3 (bottom right) images dated 22/12/68, with Stellarium estimate of time at terminator. We’ve now moved on a couple of hours, and the Rocky mountains are beginning to disappear into night. 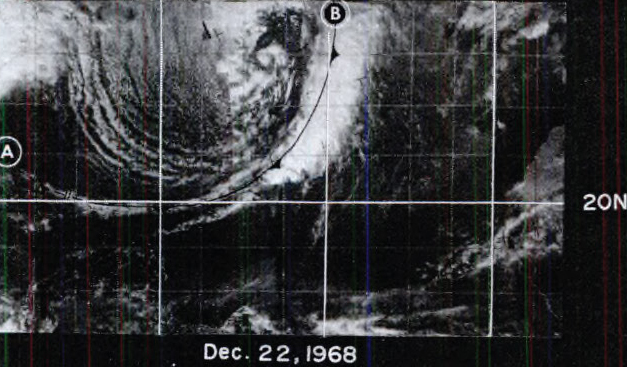 There is no direct reference to the photograph being taken, but roughly an hour later communications issues led to Hawaii being asked to send messages, suggesting that the Pacific view in the photograph is consistent (as we would expect) with the mission narrative. The area shown is an intermediate one between the those covered by ATS-1 & 3, but the blue arrow points to the same system as is shown in figure 4.1.14. The most distinctive weather system is that off the Californian cast, where two bands of clouds separate and then rejoin in a long arc (red and green arrows). As the time suggested by Stellarium is 23:30. The ATS-1 image was taken at 00:54 on the 22nd, so is some time before the Apollo image, but as the next ATS-1 image was taken at 22:43 on the 23rd, it falls almost exactly between the two. This time gap is enough to explain the small-scale differences, but is close enough temporally to cover the large scale similarities. 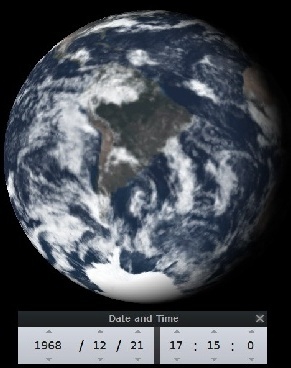 ATS-3 was taken much closer, 14:59 on the 22nd. 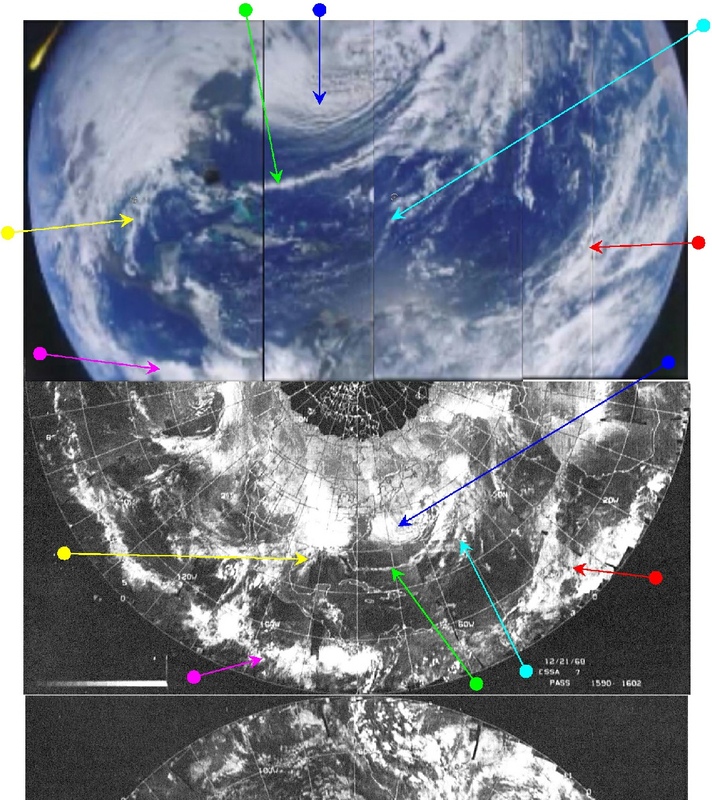 While not identified specifically, there is good correspondence between the Apollo photograph and ATS-3 in terms of the swirl of light banded cloud off western south America. ESSA’s image is a much better match than either of the ATS satellites, as its orbital pass is much closer in time. The closest pass to the terminator is number 4, or pass 1608, which started at 21:05. The next image of Earth is AS08-16-2606, shown below in figure 4.1.23, and analysed in figure 4.1.24, and is taken not long after the preceding one. Figure 4.1.9: ESSA 7 (left) and ATS-1 (below left) images compared with AS08-16-2597 and Stellarium estimate of time at terminator. Figure 4.1.24: ESSA-7 (left) and ATS-1 (below) compared with AS08-16-2606 and Stellarium estimate of time at terminator. 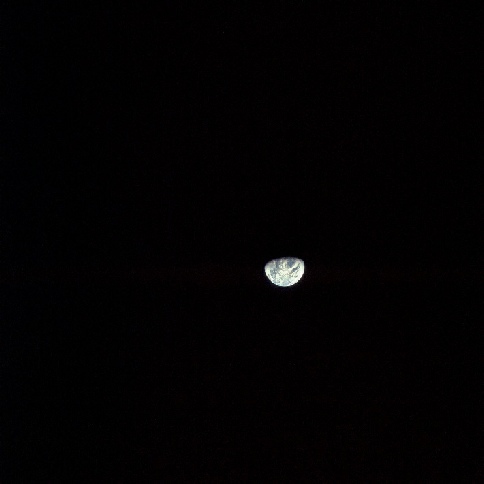 Figure 4.1.1: Composite of several screenshots from Apollo 8 16mm footage. Comparing this with the ESSA mosaic is a relatively straightforward business once it is realised that the film sequence used in the original video is the wrong way round - the camera was mounted so that it filmed using a mirror pointing outside. More importantly, the Earth orbit insertion at 13:00 on the 21st was still several hours before this area was covered by the ESSA satellite. 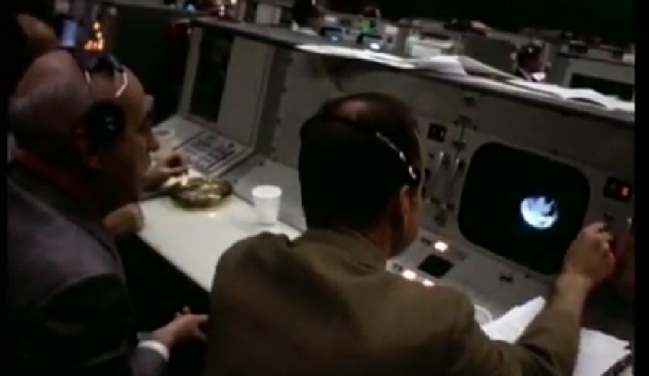 There is no ATS image for this date, but the evidence from ESSA clearly matches the Apollo video. The fact that it is a moving image, not a static photograph and complete with lumps of space hardware spinning in micro-gravity, is also an excellent refutation of the suggestion that the images were faked. 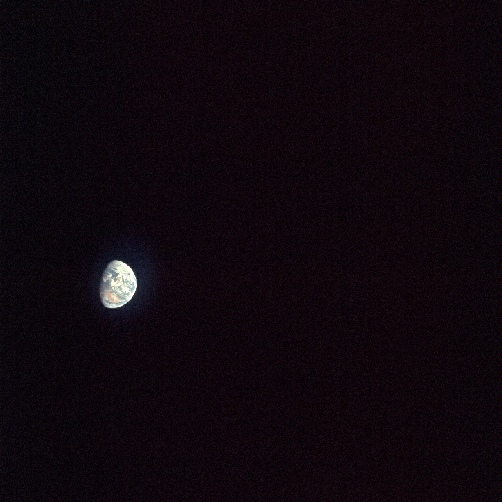 003:35:44 Borman: We see the Earth now, almost as a disk. 003:35:59 Lovell: We have a beautiful view of Florida now. We can see the Cape, just the point. 003:36:06 Lovell: And at the same time, we can see Africa. West Africa is beautiful. I can also see Gibraltar at the same time I'm looking at Florida. Which shows they are exactly where they should be. A little after this we have the images of a full Earth in Hasselblad magazine number 16. This magazine is notable because it contains images from all stages of the mission from initial low earth orbit, separation of the Saturn IV-B stage, lunar orbital images, and then images of the approaching Earth on the voyage home. It was also used in the TV series ‘UFO’ many times between 1969-70, and in the 1972 film ‘Silent Running’ as the film’s hero looks back to Earth through a telescope. 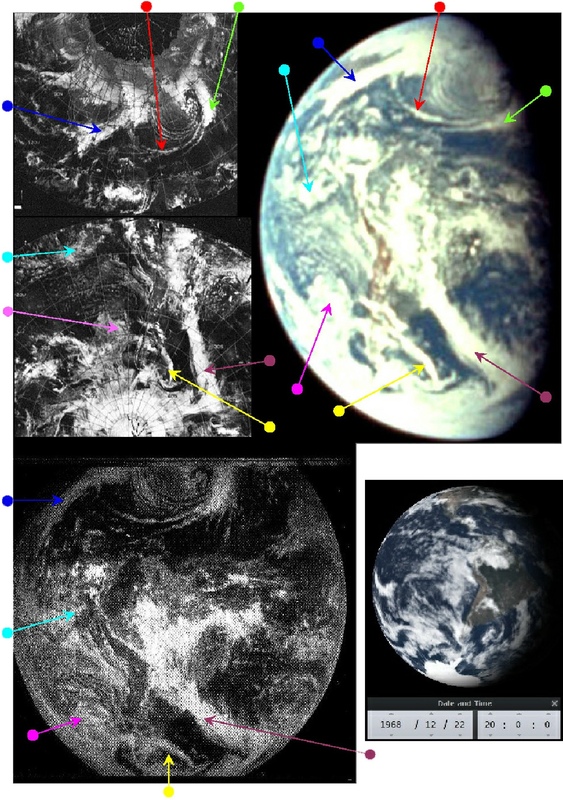 The first image showing the entire Earth is AS08-16-2593 (figure 4.1.2), and it is compared with satellite images in figure 4.1.3. 004:37:15 Borman: I can still see the Cape and isthmus of Central America. 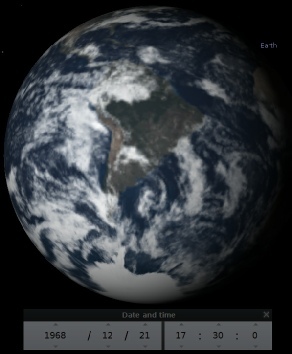 ESSA 7 data suggest that South America would have been photographed by the satellite at about 19:09, as this was when track 3 (pass number 1594) of the satellite's daily orbit over it was commenced. The time over the terminator area would be more covered by track number 1, orbit 1592, which commenced at 15:05. 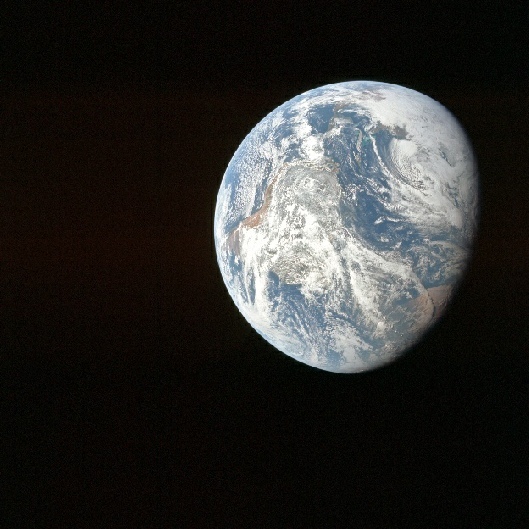 At the time of the Apollo image, then, it would be another 2 hours before the satellite would image the area photographed, and there would be a further few hours on top of that before all the visible Earth was covered. The next in the series of images taken showing any significant change in the scene below them is AS08-16-2595, which is shown below in figure 4.1.5, and analysed in figure 4.1.6. Figure 4.1.4: 16mm stlll, (left) with the terminator around Africa compared with that from figure 4.1.1, and a Stellarium estimate of time at terminator. 008:24:29 Anders: …Sure got a nice view of the Earth from here. We can see Baja California and about where San Diego ought to be. Which is pretty much bang on the money. The next frame in the magazine we have another view of a still more rotated Earth, and this time it has moved far enough to allow an image from ATS-1 to be included in the analysis. AS08-16-2597 is shown below in figure 4.1.8, and compared with the satellite images in figure 4.1.9. 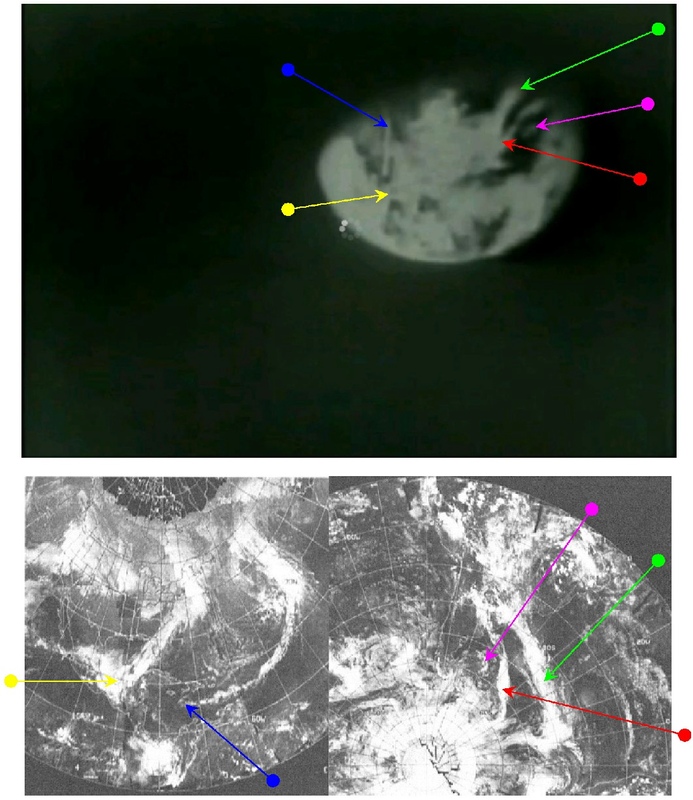 Figure 4.1.7: Comparison of 16mm still with Apollo image from figure 4.1.5. 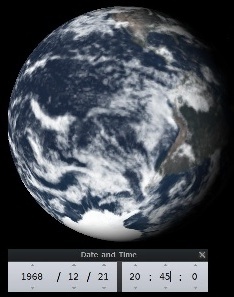 A few hours later, we have the next image of Earth showing movement, AS08-16-2599. This is shown below in figure 4.1.11, and analysed in figure 4.1.12a. A couple of images later in the magazine we have another new image of Earth, this time showing Africa as the dominant land mass in view. AS08-16-2601 is shown below in figure 4.1.14, and analysed in figure 4.1.15. The ESSA-7 image in that analysis is dated the 22nd, and the dividing line between those orbits that started on the 22nd and finished on the 23rd can be seen to the east of Africa in the southern hemisphere, running up Arabia and across eastern Europe in the northern hemisphere., The majority of the Apollo image is west of that line. The screenshot and associated ESSA images are in figure 4.1.26. The TV image is overexposed, but weather systems in both Hemispheres are easily identifiable. 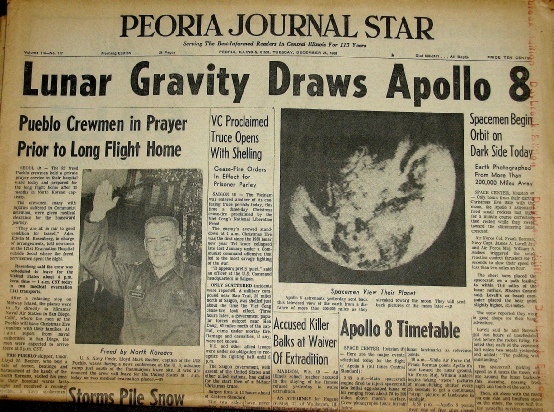 The broadcast of Earth from space made headline news around the world, but two interesting front pages are from the Long Beach Independent and Minneapolis Tribune of 24/12/68. Figure 4.1.27 shows these front pages, with the same weather systems in 4.1.26 identified (only one image has been arrowed for the sake of simplicity). The newspapers were published on the 24th, and therefore can only have been taken from the TV broadcast on the 23rd. It could not have been produced from ESSA satellites imagery as the image for the 23rd would not have been completed until the 24th, by which time the newspapers would have been in production. The TV image can only have been broadcast from space on the 23rd. 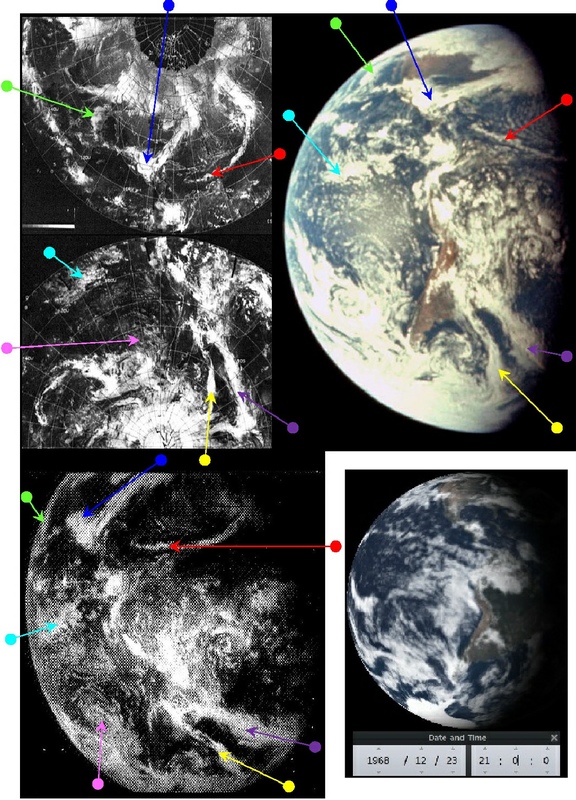 The ATS-3 image could, in theory, have been available, but the polar areas are missing and the angle of view, location of the terminator line, and weather systems visible on the western limb are different. Another image is also available of the TV broadcast in the form of the image shown below (figure 4.1.28), available from the Facebook site Retro Space Images. 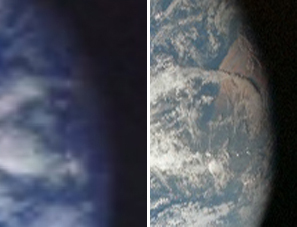 A zoomed and cropped image of the large monitor screen (figure 4.1.29) shows that the image on the screen (and on every monitor visible) is the same as the one on the newspaper front page, which, in turn, is an exact match of the satellite photos from the same date. 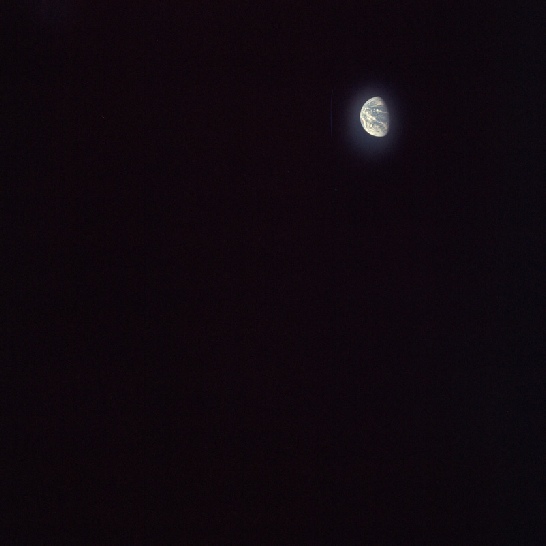 055:10:28 Lovell: What you're seeing, Mike, is a - Houston, what you are seeing is the Western Hemisphere. Looking at the top [left in this image] is the North Pole; in the center - just lower to the center is South America - all the way down to Cape Horn. I can see Baja California and the southwestern part of the United States. There's a big, long cloud bank going northeast, covers a lot of the Gulf of Mexico, going up to the eastern part of the United States, and it appears now that the east coast is cloudy. I can see clouds over parts of Mexico; the parts of Central America are clear. And we can also see the white, bright spot of the subsolar point on the light side of the Earth. 055:12:17 Lovell: Okay. For colors, the waters are all sort of a royal blue; clouds, of course, are bright white; the reflection off the Earth is - appears much greater than the Moon. The land areas are generally a brownish - sort of dark brownish to light brown in texture. Many of the vortices of clouds can be seen of the various weather cells, and a long band of - it appears cirrus clouds that extend from the entrance to the Gulf of Mexico going straight out across the Atlantic. The terminator, of course, cuts through the Atlantic Ocean right now, going from north to south. [The] southern hemisphere is almost completely clouded over, and up near the North Pole there is quite a few clouds. Southwestern Texas and southwestern United States is clear. I'd say there are some clouds up in the northwest and over in the northeast portion. 055:19:25 Lovell: …I can pick out the southwest coastline of the Gulf and where Houston should be, and also the mouth of the Mississippi; I can see Baja California and that particular area. I'm using a monocular which we have aboard. Unsurprisingly, this is an entirely accurate description of what is evident from the satellite photographs. For the next still view of Earth we return to magazine 16. AS08-16-2607 has rotated slightly from the previous Hasselblad, but there isn’t enough of a difference to make it worth examining as a separate case. 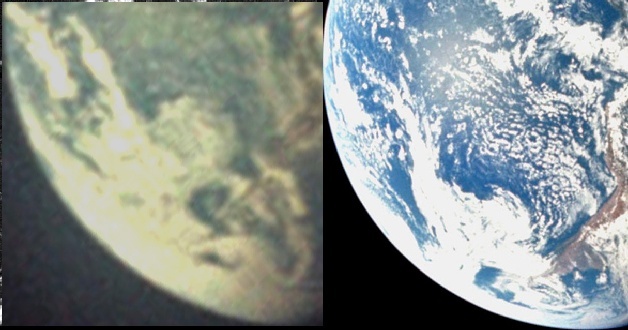 Therefore the next photograph from magazine 16 to be analysed is one of the final pair from it before images of the lunar surface are found, which at the very latest puts it at before the 25th of December, and once again south America is the dominant view in the photograph. AS08-16-2608 is shown below in figure 4.1.31, and analysed in figure 4.1.32. 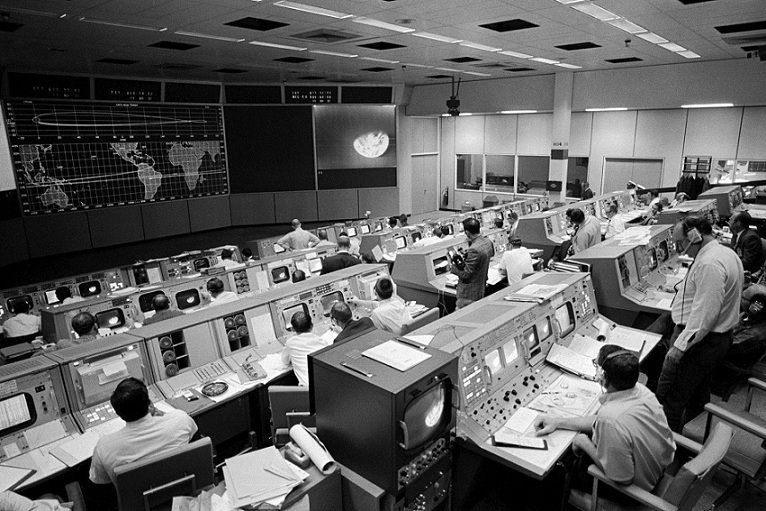 We also have TV footage of mission control during this TV broadcast (Moon Machines), and if we look carefully we can see the same TV broadcast can be seen on a monitor, with the same clouds – see figure 4.1.30, and we can also include a newspaper page showing the scene to prove when it was done. 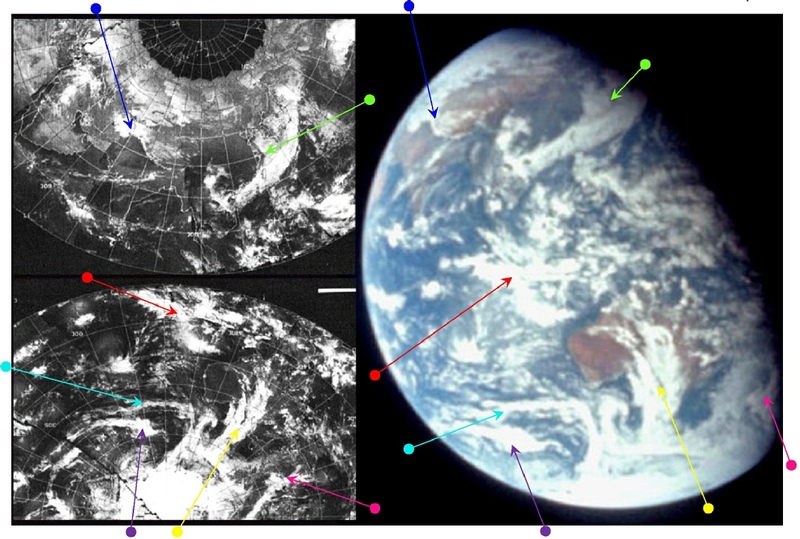 The rotation of the Earth in this photograph compared with the previous one is such that the ATS image no longer has any features that are visible in it, and the only weather system identified in the previous image that is also identifiable in this one is the one picked out by the magenta arrow. 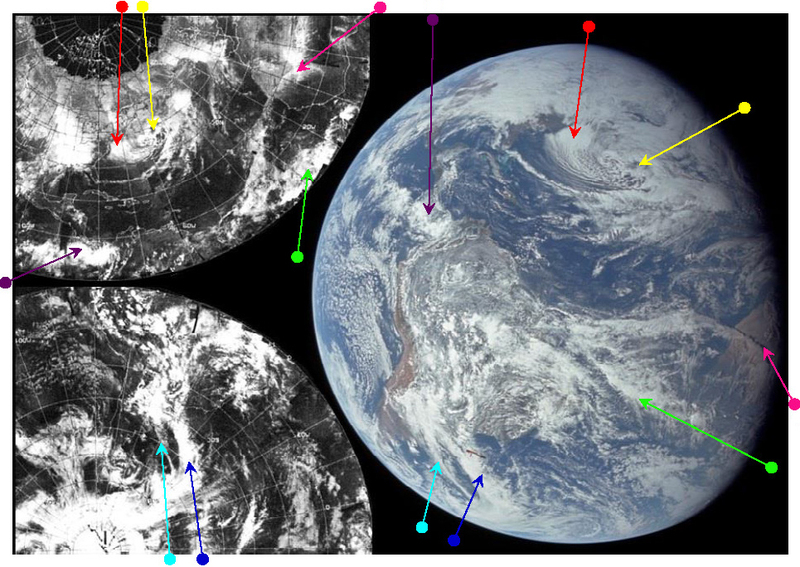 The system picked out by the blue arrow in figure 4.1.9 can still be seen on the satellite image, just as the green arrow here identifies a weather pattern that was visible on the ESSA part of figure 4.1.9, so it is obviously a continuation of the weather observations on the day. The plume of cloud extending up from Antarctica (yellow) is very easy to pick out in the Apollo image, as are the streams of west trending clouds to the west of it (purple and cyan arrows), the 'Y' shaped pattern near the equator (red arrow), and the Himalayan clouds (blue arrow). Stellarium shows that the terminator is showing a time of approximately 07:00, and this can be compared with an ESSA time for the orbit nearest the terminator of 02:05 (orbit 1598, track 7). 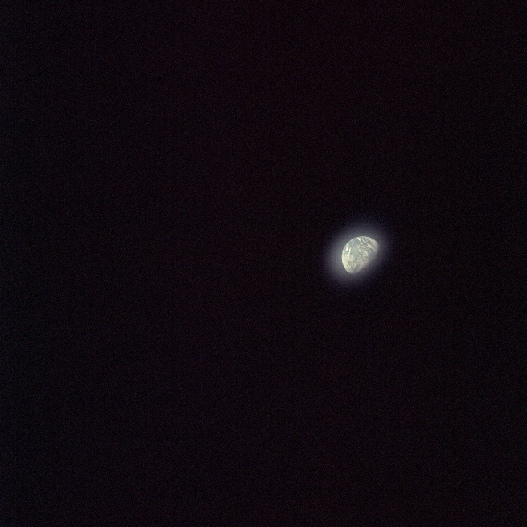 An interesting feature of this particular Apollo 8 image is that it was taken while a US Corona satellite was in operation. Corona satellites were relatively short lived spy satellites launched to photograph enemy installations and troop movements. The film canisters were fired from the re-entering satellite and were caught by aircraft snagging trailing wires on their parachutes. Film at the time was a much better medium for detail compared with their TV picture transmitting counterparts, and the method also prevented the images being intercepted by unfriendly countries. 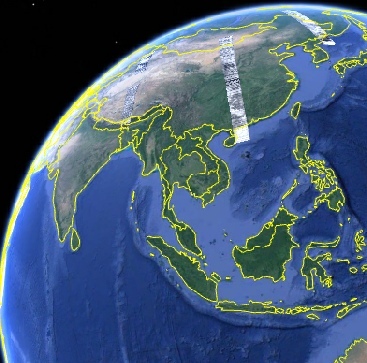 The now declassified images are available here, and it is possible to download low quality versions of the image in a format that allows them to be superimposed on Google Earth. One of the satellite passes is covered here in the context of showing how many passes you would need to get the same images taken by Apollo. On this image we have three areas we can examine. 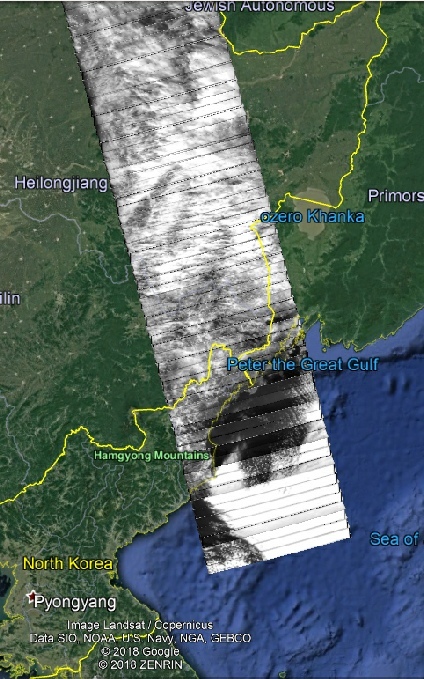 The first is over the coast of north Korea and China, and I’ve shown it below in figure 4.1.12b. Figure 4.1.12b: AS08-16-2599 (top left) with area show in the Corona image (right) highlighted in red. Crop of that area in the Apollo image (centre) and Google Earth image showing the location of the Corona path (bottom left). It’s worth pointing out a few caveats here before drawing any conclusions. We have no real idea when these images were taken other than the date, and there are very few clues available to us as to what time of day it might be. The lack of shadows on the ground suggests that the sun may well be high overhead in late morning/noon, and as the next orbital swathe available shows shadows indicative of early afternoon this doesn’t seem too far out. The Apollo image was taken at 07:00 GMT, but this translates to much later in the day in the image. The local sunset time for North Korea at this time of year is around 17:00, or 08:30 GMT, so the Apollo and Corona images could be separated by as much as 6 hours. Another thing to consider is whether I’ve accurately worked out which location is being shown in the image given that most of the coastal area that would help us identify it precisely is under cloud. We do, however, have the ESSA satellite image that shows us coastal outlines, and this helps us to confirm that the clouds skirt around the Korean peninsula, and we do have the location correctly identified. What the Corona image identifies is an area of clear skies off the east coast of North Korea, with a similar gap between the clouds that next to this gap and the coast to the north. The Apollo image shows a similar pattern. A couple of orbits later and Corona begins a pass over China that ends just east of Hainan Island. Close examination under the clouds on land show shadows angled slightly towards the terminator suggestive of a photograph time of late morning/early afternoon. Figure 4.1.12c shows the details. Figure 4.1.12c: AS08-16-2599 (top left) with area show in the Corona image (right) highlighted in red. Crop of that area in the Apollo image (centre) and Google Earth image showing the location of the Corona path (bottom left). Again it’s worth bearing in mind the time gap between the two images, but as with the previous Corona pass the broad details are confirmed: the thick swathe of coastal cloud, some thinner bands just inland, and some lighter bands of cloud to the north. 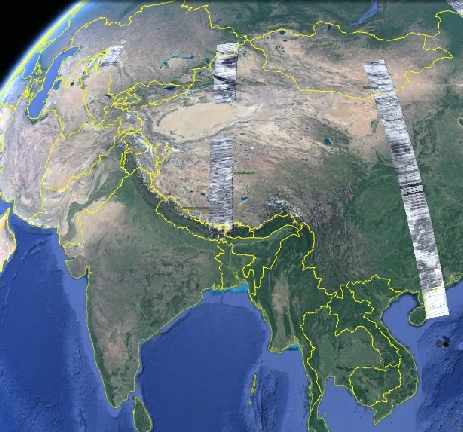 The final pass visible in this image covers two sections stretching from Kazakhstan in the north to the Nepalese border in the south, as shown in figure 4.1.12d. Figure 4.1.12d: AS08-16-2599 (top left) with area show in the Corona image (right) highlighted in red. Crop of that area in the Apollo image (centre) and Google Earth image showing the location of the Corona path (bottom left). In this case the main feature in the Corona image is the large ‘C’ shaped cloud over Kazakhstan, and this feature can also be seen at the top of the Apollo image. 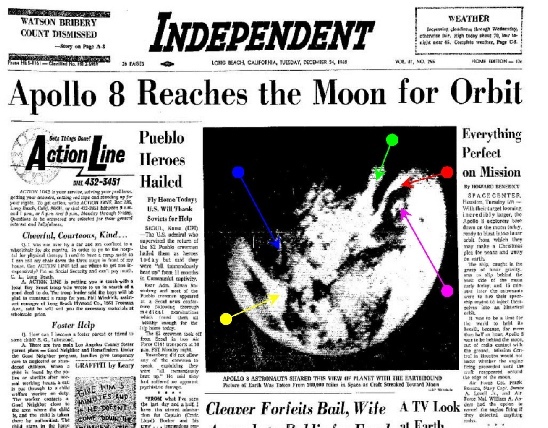 Also accompanying the Apollo still is a 16mm equivalent to the still image, and as with the previous image there is no apparent time difference between the two (figure 4.1.13). Figure 4.1.27: Front pages of the Long Beach Independent (top left), Minneapolis Tribune (top right), Toledo Times (upper middle left), New York Times (upper middle right), Pittsburgh Post Gazette (lower middle left) Peoria Journal Star (lower middle right) and the Daily News (left) . 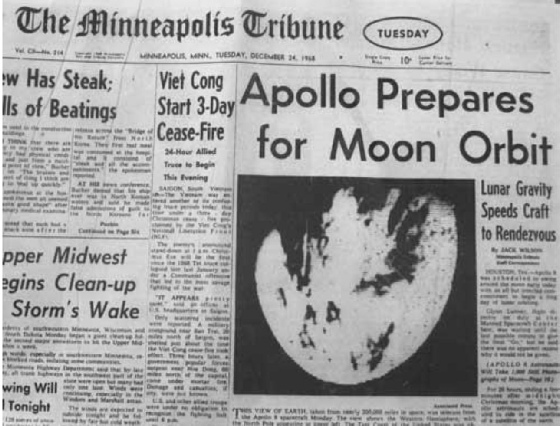 Sources: newspaperarchive.com, blogspot, rarenewspapers.com, Facebook Apollo groups.